Note that this is an exact copy of the instructions included with the bar. 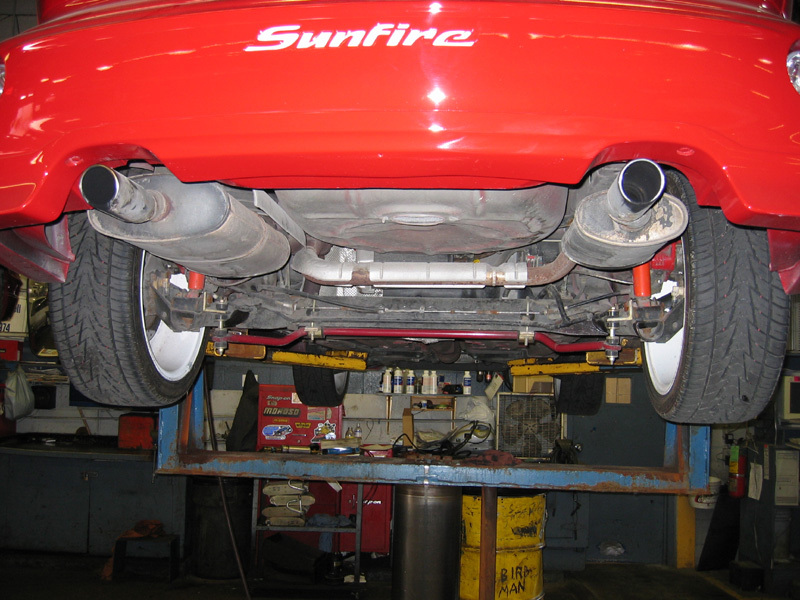 Note: If your car has an OE anti-roll bar, it is integrated into the beam axle and cannot be removed. The Eibach bar is designed to work with or without the OE rear bar. Raise the rear of the vehicle so the tires are off the ground. Support the chassis with safety stands. NEVER work under a vehicle being supported by a jack! Install the V-shaped bolts over the axle, centered over the outer hole. 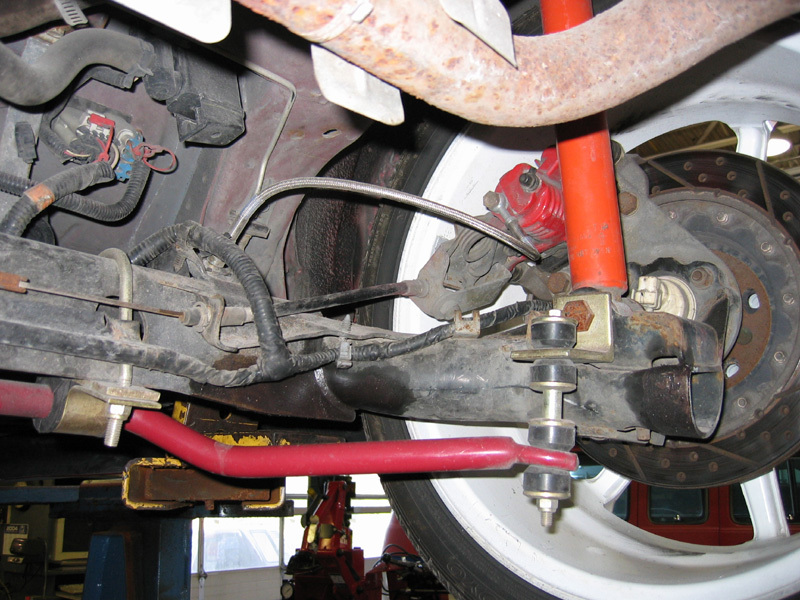 Be sure the V-bolt is under any brake lines or electrical lines which may run along the axle. See photo. Install the flat mounting plates onto the V-Bolt. This will be snug, so you may need to tap it on with a rubber mallet. Lubricate the bushings and fit them onto the bar. Now fit the supplied bracket over the bushings. Mount the bar up to the V-Bolts using a washer and lock nut. See Photo. Support the axle at the tires with a jack and remove the lower bolts that attach the Spring and Shock assemblies to the axle. Be sure to adjust the height of the jack so there is no load or pressure on the spring and shock assembly. This will allow the bolts to be removed more easily. Mount the L-Bracket to the lower shock mount using the bolt supplied. The bolt goes through the smaller hole and the L-Bracket faces down. Do not torque at this time. See Photo. 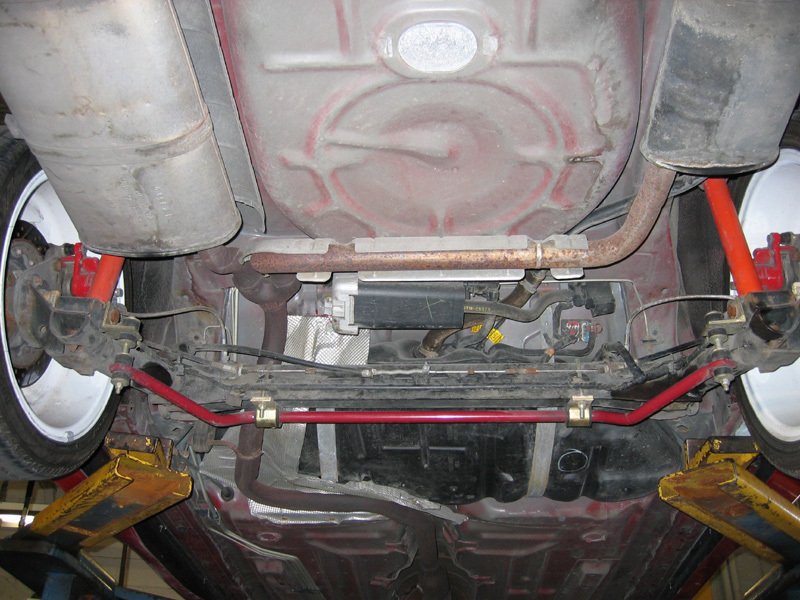 Swing the anti-roll bar up to the bracket and install the end links provided. See Photo. Rotate the L-Bracket until it is square with the end-link assemblies. Tighten the lower shock mount bolts and the end link assemblies. Do not over tighten the end-links. Tighten until the bushings are the same diameter as the washers. Tighten the V-Bolts making sure the V-Bolt is drawn down to the top of the beam axle. Tapping it down with a rubber mallet may be necessary. Lower the axle. Lower the vehicle to the ground. After 100 miles all bolts must be retightened.